Beer Belly Deli's pressed paninis are pockets of crisp, melted deliciousness. If the food served here pleases the palate as easily as its name rolls off the tongue, Beer Belly Deli will officially be the best thing to me since sliced multigrain bread. The sandwich I chose to put my hands on was The Havana, a pressed panini stuffed with porketta, ham, Swiss cheese, pickled chips and deli mustard. The Cuban-style sandwich was perfect for my belly, from the crunch of the toast to the melted cheese to the bite of the mustard and chips. Plus, you get a pickle spear and your choice of pasta salad, potato salad or macaroni salad. Some additional honorable mentions that I want to try on future visits are The Palmetto, a nod to the South with pimento cheese, ham, bacon, tomato, red onion and chipotle mayo stacked between two slices of multigrain. And, in the spirit of the holidays, The Gobbler, with turkey, stuffing, cranberry relish and arugula on an onion roll served with a side of brown gravy. Choose to order takeout or take a seat at one of the cute cafe tables to the left of the open kitchen, or belly up to the bar, where they serve craft beer, wine and a great happy hour from 3–6 p.m. seven days a week. 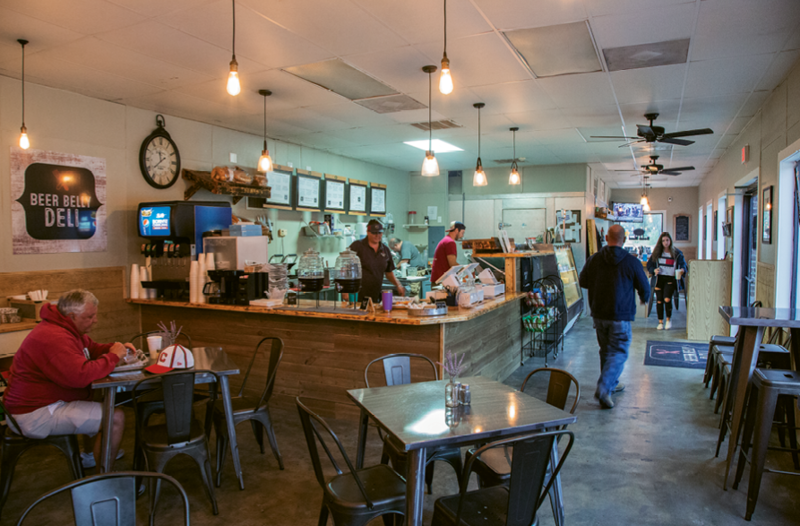 Whether you choose to eat or drink your way to a beer belly, the Beer Belly Deli will happily provide you fresh ingredients prepped and crafted in some of the most unique ways on the inlet.